We have released new survey software features to add more user power in Spark Chart. We have released a feature to allow some survey content edits in live projects after responses have been received. Live survey edits can now be made without relaunching the survey project. Changing a survey in a live project when respondents have started completing surveys can impact the vailidity of the survey results. So, this feature should be used with care. These changes will not affect the survey template and the survey edits will not be included if the project is copied. Additional live survey editing features will be made available in future updates. The Tools drop down menu (with Relaunch and Edit original survey template) has been moved to the Modify Survey menu under the Manage Project. 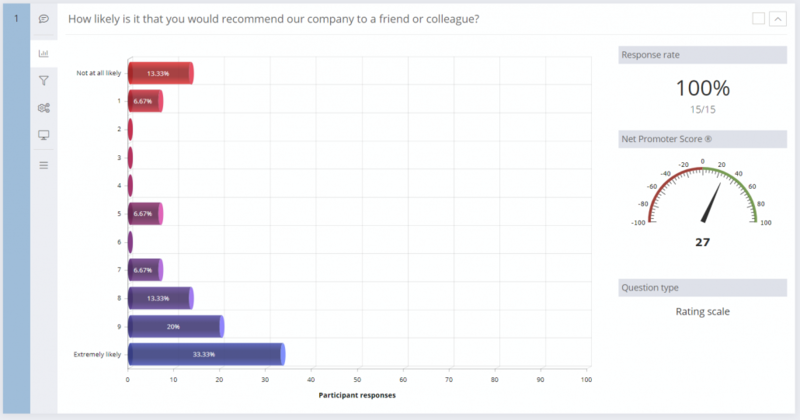 The Net Promoter Score now calculates automatically for all questions with a rating scale ranging from 0 to 10. A Gauge with a scale from -100 to +100 will show for NPS questions in reports. Additionally, reports can be filtered by selected dates, meaning NPS can be measured and reported over time to allow comparison of performance between time periods. 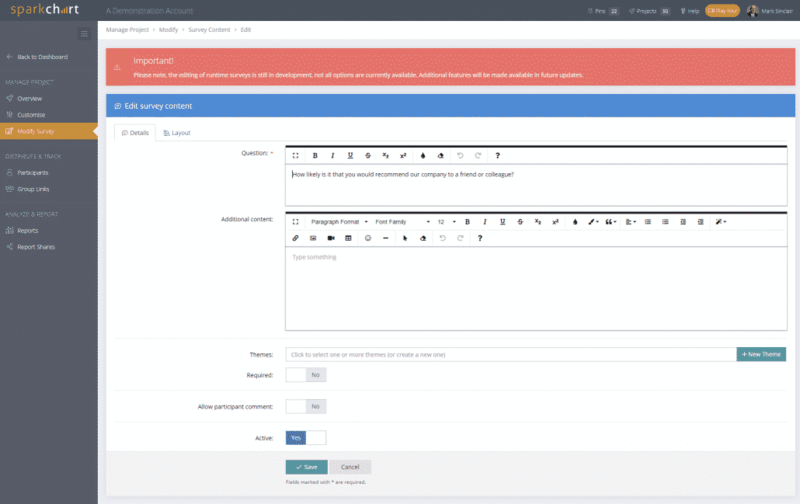 Questions in Survey templates can now be copied with all layout settings. This saves time for users when they are entering many questions with the same layout. Select the purple copy button and then edit the copied question. We have commenced releasing new survey answer layouts. A “Layout” tab has been added to the “Edit Survey Content” form. Initially, we have released Vertical/Dropdown options for Multiple Choice Single Answer and answer text box size options for Free Text Questions. More layouts will follow soon.